The year 2009 saw the rise of a seemingly simple tower defense game for the PC. The game is called “Plants vs. Zombies”, the game took the world by storm, or at least the gaming community. It is now considered a top gun among tower defense games, admired by others who wish to emulate its commercial success. Simple. Prevent the horde of zombies from reaching your house by utilizing a platoon of zombie-belligerent plants. You have your pick of peas to watermelons. There are even cactuses in case of flying zombies. Plants vs. Zombies, also known as PvZ, has 4 type of game modes which are pretty much the same but definitely adds a lot to the game’s replay value. There’s Adventure Mode, Mini-games, Puzzle and Survival. There’s also a Zen garden that you can unlock once the adventure mode is completed. Plants vs. Zombies’ gameplay contains a little bit of farming (or more appropriately, gardening) and zombie killing. The player starts by collecting sunflower suns which serves as the in-game currency along with the garden coins. These suns are used to buy more plants and other defensive flora. Another strong point of Plants vs. Zombies is its music. I can only describe it as modern and strange in a good way. It adds a lot of flavor to the game. As good as the gameplay is, it probably won’t be half as interesting without the music. There’s even a cute music video at the end of Adventure mode where we get to see a singing sunflower accompanied by a wave of talented zombies. The game is very addictive and entertaining. Plants vs. Zombies is one of those games that even older adults can enjoy, this says a lot about the games appeal. It’s a game that is very easy to pick up and let go (If you wanted to), so it’s the ideal game for killing some time during short breaks from school or work. The game is so good that a lot of gamers are demanding a sequel. It seems like a no-brainer at first but there are no announcements about it so it seemed for a while that all hope for a sequel is lost. Then suddenly, it came. 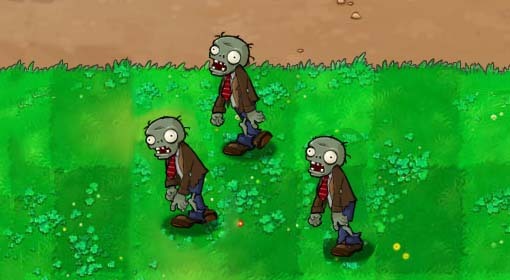 Plants vs. Zombies 2 is expected to be released in the spring time of 2013. Makes you wonder what elements it might contain. Will it include coconuts?